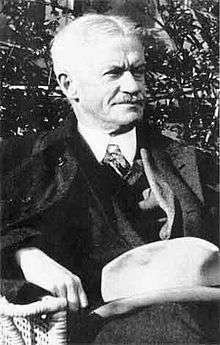 Albert Jay Nock (October 13, 1870 – August 19, 1945) was an American libertarian author, educational theorist, Georgist, and social critic of the early and middle 20th century. Throughout his life, Nock was a deeply private man who shared few of the details of his personal life with his working partners. He was born in Scranton, Pennsylvania (U.S.), the son of Emma Sheldon (Jay) and Joseph Albert Nock, who was both a steelworker and an Episcopal priest. He was raised in Brooklyn, New York. Nock attended St. Stephen's College (now known as Bard College) from 1884–1888, where he joined Sigma Alpha Epsilon fraternity. After graduation he had a brief career playing minor league baseball, and then attended a theological seminary and was ordained as an Episcopal priest in 1897. Nock married Agnes Grumbine in 1900 and the couple had two children, Francis and Samuel (both of whom became college professors), but Nock separated from his wife after only a few years of marriage. In 1909, Nock left the clergy and became a journalist. However, while Nock was a lifelong admirer of Henry George, he was frequently at odds with other Georgists in the left-leaning movement. Further, Nock was deeply influenced by the anti-collectivist writings of the German sociologist Franz Oppenheimer, whose most famous work, Der Staat, was published in English translation in 1915. In his own writings, Nock would later build on Oppenheimer's claim that the pursuit of human ends can be divided into two forms: the productive or economic means, and the parasitic, political means. "The Myth of a Guilty Nation," which came out in 1922, was Albert Jay Nock's first anti-war book, a cause he backed his entire life as an essential component of a libertarian outlook. The burden of the book is to prove American war propaganda to be false. The purpose of World War I, according to Nock, was not to liberate Europe and the world from German imperialism and threats. If there was a conspiracy, it was by the allied powers to broadcast a public message that was completely contradicted by its own diplomatic cables. Along with that came war propaganda designed to make Germany into a devil nation. In his 1936 article "Isaiah's Job", which appeared in the Atlantic Monthly and was reprinted in pamphlet form in July 1962 by The Foundation for Economic Education, Nock expressed his complete disillusionment with the idea of reforming the current system. Believing that it would be impossible to persuade any large portion of the general population of the correct course and opposing any suggestion of a violent revolution, Nock instead argued that libertarians should focus on nurturing what he called "the Remnant". Against charges of anti-Semitism, Nock answered, "Someone asked me years ago if it were true that I disliked Jews, and I replied that it was certainly true, not at all because they are Jews but because they are folks, and I don't like folks." Despite his distaste for communism, Nock harshly criticized the Allied intervention in the Russian Civil War following the parliamentary revolution and Bolshevik coup in that country. Before the Second World War, Nock wrote a series of articles deploring what he saw as Roosevelt's gamesmanship and interventionism leading inevitably to US involvement. Nock was one of the few who maintained a principled opposition to the war throughout its course. Despite becoming considerably more obscure in death than he had been in life, Nock was an important influence on the next generation of laissez-faire capitalist American thinkers, including libertarians such as Murray Rothbard, Ayn Rand, Frank Chodorov, and Leonard Read, and conservatives such as William F. Buckley, Jr.. Nock's conservative view of society would help inspire the paleoconservative movement in response to the development of neoconservatism during the Cold War. In insisting on the state itself as the root problem, Nock's thought was one of the main precursors to anarcho-capitalism. In the fictional The Probability Broach by L. Neil Smith, as part of the North American Confederacy Series, in which the United States becomes a Libertarian state after a successful Whiskey Rebellion and the overthrow and execution of George Washington by firing squad for treason in 1794, Albert Jay Nock serves as the 18th President of the North American Confederacy from 1912 to 1928. Our Enemy, the State. ePub MP3 HTML William Morrow & Company, 1935. ↑ Wreszin, Michael (1972). The Superfluous Anarchist: Albert Jay Nock, Brown University Press, p. 11. ↑ Powell, Jim (March 1, 1997). "Albert Jay Nock: A Gifted Pen for Radical Individualism". The Freeman. Foundation for Economic Education. ↑ Neilson, Francis (1946). "The Story of 'The Freeman'". The American Journal of Economics and Sociology. 6 (1): 3–53. ↑ Presley, Sharon (1981). "Suzanne La Follette: The Freewoman," Libertarian Review (Cato Institute). 1 2 Mencken, H.L. (1926). "The Immortal Democrat". American Mercury. 9 (33): 123. ↑ Originally published in 1922 by B. W. Huebsch, Inc. Published in 2011 by the Ludwig von Mises Institute. ↑ Nock, Albert Jay (1956). "Isaiah's Job". The Freeman. 6 (12): 31–37. ↑ Harris, Michael R. (1970). Five Counterrevolutionists in Higher Education: Irving Babbitt, Albert Jay Nock, Abraham Flexner, Robert Maynard Hutchins, Alexander Meiklejohn, Oregon State University Press, p. 97. ↑ Cram, Ralph Adams (1932). "Why We Do Not Behave Like Human Beings". The American Mercury. 27 (105): 41–48. ↑ Nock, Albert Jay (1941). "The Jewish Problem in America," The Atlantic Monthly, June 1, pp. 699–705. ↑ Crunden, Robert Morse (1964). The Mind and Art of Albert Jay Nock, Henry Regnery Company, pp. 183–84. ↑ Buckley, Jr., William F. (2008). Let Us Talk of Many Things: The Collected Speeches, Basic Books, p. 430. ↑ Wreszin, Michael (1969). "Albert Jay Nock and the Anarchist Elitist Tradition in America," American Quarterly, Vol. 21, No. 2, Part 1, pp. 165–89. ↑ Nock, Albert Jay (1924). "On Doing the Right Thing". American Mercury. 3 (11): 257–62. ↑ Nitsche, Charles G. (1981). Albert Jay Nock and Frank Chodorov: Case Studies in Recent American Individualist and Anti-statist Thought, (Ph.D. Dissertation), University of Maryland. Cline, Edward (January 8, 2009). "Albert Jay Nock: How to Throw the Fight for Freedom". Capitalism Magazine. Hamilton, Charles (2008). "Nock, Albert J. (1870–1945)". In Hamowy, Ronald. The Encyclopedia of Libertarianism. Thousand Oaks, CA: SAGE; Cato Institute. pp. 356–57. ISBN 978-1-4129-6580-4. LCCN 2008009151. OCLC 750831024. Opitz, Edmund A (1975). "The Durable Mr. Nock" (PDF). The Intercollegiate Review. X (1): 25–31. Riggenbach, Jeff (September 10, 2010). "Albert Jay Nock and the Libertarian Tradition". Mises Daily. Ludwig von Mises Institute. Tucker, Jeffrey A. (October 12, 2007). "Albert Jay Nock: Forgotten Man of the Old Right". Mises Daily. Ludwig von Mises Institute. Rev. Mark D. Isaacs (May 10, 2000). "Albert Jay Nock". Libertarian. Find a Grave. Retrieved November 18, 2013.